Of all the grand viewpoints in Yosemite National Park, 9,926 foot Clouds Rest gives perhaps the best panorama of all. The mountain rises higher than anywhere to the west, is over 5 miles away from taller peaks in the east, and as its top is a smooth dome of bare granite there is nothing to block the 360° vista, which includes all of Yosemite's most famous landmarks. The shortest route to the top is a 7 mile path starting at Tenaya Lake, and while the trip is not always so exciting, being mostly through woods with only limited long distance views, the summit more than makes up for that, taking in much of Tenaya Canyon, the distinctive peak of Half Dome (1,090 feet below), the upper Merced River valley, the Cathedral Range, Mt Hoffmann and many more distant mountains. Although quite long, the trail is relatively easy, with only two steep sections interrupting an otherwise level or gently climbing route through the forest. Clouds Rest can also be reached via the John Muir Trail starting at Happy Isles in Yosemite Valley, though this journey is 2.5 miles longer and involves an extra 3,400 feet of elevation gain. Clouds Rest topographic map, Tuolumne Meadows trails. 13 views along the trail to Clouds Rest. 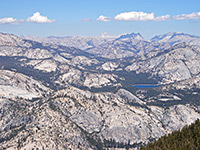 Panorama from the summit of Clouds Rest. The route to the peak involves three separate paths, all well used and in a good state of repair. It starts with the first 2.7 miles of the Sunrise Trail, followed by 2.3 miles of the Forsyth Trail, and finally the actual Clouds Rest Trail for 2 miles. 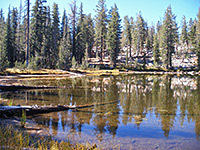 The Sunrise Trail begins by the west side of Tenaya Lake at the center of the most scenic stretch of the Tioga Road, and is one of the more popular trailheads in the Tuolumne Meadows district. Next to the highway is a rather small car park that in summer often fills up by mid morning, though cars can also be left along the edge of the road. As with all trailheads in this area, bear proof storage lockers are provided; food should be left in these rather than in vehicles. The Sunrise Trail heads straight into the woods, soon reaching a junction with a path towards Olmstead Point, then, after crossing a grassy meadow and the outlet channel of Tenaya Lake, arrives at another junction with a path to Tuolumne Meadows, which runs along the southeast shore of the lake. The main trail climbs quite gently through woodland, passing one open area beside a granite outcrop, then re-enters the forest which in places is quite dense, made up of a mixture of different sizes of pine trees growing close together. After a few stream crossings, the path begins a steep climb, 1,000 feet up the lower slopes of Sunrise Mountain by means of many switchbacks through tall pine trees, still with only limited views of the wider landscape. The path divides upon reaching a flat area at the end of a ridge - left is the Sunrise Trail, continuing towards Sunrise Lakes and the nearby High Sierra Camp, while right is the start of the Forsyth Trail. From the junction, the Forsyth Trail descends a granite slope, then passes a patch of woodland, a small meadow, a stream and an area of jumbled white boulders mixed with dwarf aspen trees - a place that allows a clear sight of Sunrise Mountain rising above - though as before, most of the path has views only of the forest. Past the boulders is a short descent to a pretty, calm pond, good for photographing reflections of the enclosing trees. Soon after are two more stream crossings as the path becomes almost level, providing a nice, easy walk through quiet woodland for nearly a mile, until a small ascent to quite a level area of well separated trees, a location popular for camping. The Clouds Rest Trail begins here, while the Forsyth Trail bends east for a while then descends steeply into the Sunrise Creek drainage where it meets the John Muir Trail. The summit of Clouds Rest is 2 miles from the Forsyth trail junction. The path climbs through more airy woodland, now with distant peaks and valleys visible through the trees; it first heads northwest up to a saddle then turns southwest along the top of a ridge. 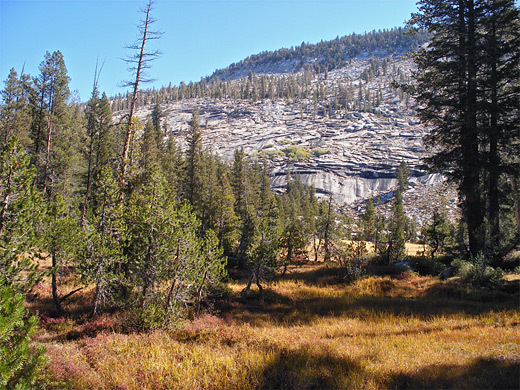 A small drop into a flat section, another good camping spot, is followed by the final ascent, still through trees until almost at the top; the trail approaches the base of the bare rock around the summit then starts to descend, down the south face of the mountain all the way to the John Muir Trail after 3 miles. 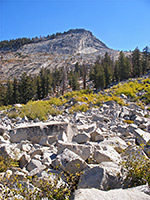 A sign marked 'Clouds Rest Foot Trail' indicates the way to the summit, up a short side path winding between granite boulders. 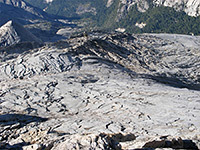 The flat part of the summit is many yards across but the rocks fall away steeply in all directions, especially to the west, where a curving, layered, granite bowl marks the upper edge of 4,000 foot deep Tenaya Canyon. The boundless views take in the rugged peaks of the eastern Sierra, south over Glacier Point and Yosemite Valley, the wooded, less steep hills to the west and more stark mountains to the north, beyond Tenaya Lake - see panorama. Close by to the south, Half Dome still looks quite intimidating when viewed from above, and even at a distance of 2 miles, the cable route to its summit is just discernible. The round trip to Clouds Rest from the Tioga Road typically takes between 5 and 7 hours.